Explore ways to add texture to your jewellery using etching techniques. Learn how to apply mordants and resists to create interesting surface decoration on a variety of metals. (Evening, Tuesdays). – Etching is an especially effective technique to add pattern, line and texture to your jewellery, and on this course we introduce you to a range of approaches that are particular to jewellery applications. Traditionally, etching is used by printmakers as a process for making repeatable prints on paper. However, when we apply the technique, our focus is directly on mark-making to enhance the surface of metal. Taking a print from your finished pieces would be the real icing on the cake! You’ll learn all about the pros and cons of various mordants and resists, and the associated health and safety issues relating to their usage. You’ll gain invaluable experience using traditional mordant / resist applications used in etching (Acids to dissolve the metal, varnishes, stencils, tapes to stop out the surface). 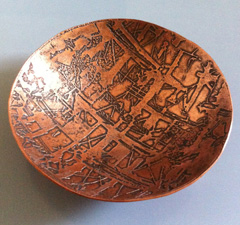 You’ll also experiment with a form of photo etching, where a photographic image can be etched onto metal plate. We’ll cover electro etching too – this is a relatively safe method for etching non precious metals at home.. Finally, we’ll discuss how to add colour using cold enamels, oxides and other patinas. You’ll produce a range of test pieces that explore the various approaches to etching, also reflecting your personal aesthetic. We anticipate that your samples will provide lasting reference -and inspiration- for your future jewellery projects. It’s likely that you will produce several finished pieces of jewellery during the course. Alternatively you may wish to concentrate on producing as many exploratory samples as possible for your future jewellery projects. The course fee covers the cost of your materials for initial experiments. If you are working on larger pieces for your personal projects we can supply the metal for you at cost. If you’d like to work with precious metals you may also bring your own supply to work with. We are able to offer a hallmarking service for precious jewellery made at Flux. So if you would like to have your work hallmarked with the Flux Studios hallmark we can arrange this at cost price. *if you are on a low wage, or in receipt of tax credits or other benefit you qualify for the Flux concessionary rate. This is a discretionary discount which we personally subsidise. Please consider how much you need this discount before choosing the concessionary option. Materials Kit : Basic materials are included. These advanced jewellery courses are designed to assist you on an one-to-one basis, by providing the tutoring, tools and equipment required to achieve your personal objectives. You will have the opportunity to improve existing skills, meanwhile also developing new skills by exploring new techniques. As the course progresses you can end up producing rings, bangles and brooches, experimental jewellery, art pieces etc. In addition, throughout these courses we introduce a new theme or technique to the group, to stimulate new ways of working.